Scientists of the SIDC observed a first solar radio burst. On the site of the Humain Radioastronomy Station, new radio receivers were installed recently. Because of the low solar activity, there was not much to detect until Thursday Dec 11. The antennas of Humain witnessed an increase of radioflux emitted by the Sun around 09:26UT. 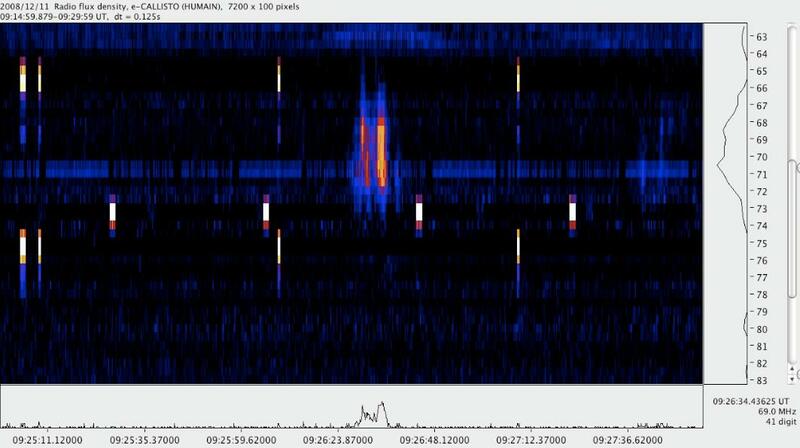 Christophe Marqué, the radioastronomer of the SIDC double checked the event and confirmed that his swiss colleagues who use an identical receiver, observed also the event. The satellite GOES measured an analogue increase in X-ray flux between 09:22 and 09:27UT. The event is catalogued as a C1 flare. The graph on the left is a colour intensity diagram: the more intens the colour, the higher the intensity of the radiation in a particular wavelength at a particular time.